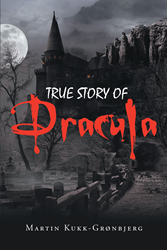 Recent release “True Story of Dracula” from Page Publishing author Martin Kukk-Gronbjerg develops how Dracula behaved among his fellow humans and how he managed to stay hidden for hundreds of years. The author has built up the character of Dracula, giving additional depth to his persona. Martin Kukk-Gronbjerg has lived in several different countries (Estonia, Russia, Sweden, and Denmark) as the son of a Danish Diplomat. He has completed his new book “True Story of Dracula”: a riveting tale that details a universe similar to our own, but in which Dracula actually existed. Published by New York City-based Page Publishing, Martin Kukk-Gronbjerg’s thrilling work follows a class from California traveling to Romania on a research trip. As they soon discover, what began as a research trip turns into a getaway trip. Kukk-Gronbjerb gives each character a great deal of depth, so that the reader can anticipate how different characters would likely react or act under certain situations, both the humans and the vampires. This tale leaves opportunity with so many well-developed characters to possibly expand this universe with additional books focusing on any number of characters. Readers who wish to experience this enthralling work can purchase “True Story of Dracula” at bookstores everywhere, or online at the Apple iTunes store, Amazon, Kobo, Google Play or Barnes and Noble.